Today on Ask the Doulas, Katie Kimball of Kitchen Stewardship and Kids Cook Real Food talks to us about how to get your little ones started safely in the kitchen. There’s also a free download, so be sure to listen so you don’t miss it! You can catch the podcast on SoundCloud or iTunes. Alyssa: Hello, welcome to another episode of Ask the Doulas. I am Alyssa Veneklase, and today we are talking to Katie Kimball of Kitchen Stewardship. Hi, Katie. Katie: Hi, Alyssa. Thanks for having me! Alyssa: Yeah. So I actually ran into you at an event a while ago and we started talking. And I had heard of your website before but dug into it a little bit more after meeting you, and there’s so much information here that I think we could probably do ten different podcasts, but we’re going to focus on one right now, and that’s kids in the kitchen. And I love this because I have a five-year-old who wants to be in the kitchen all the time, and I still don’t feel safe having her around me for most of the things I’m doing – cutting, boiling water. So I’m sure I’m not the only one, and you could probably give some tips for me and our listeners about how to start kids in the kitchen. What do we do and how early; you know, is it too early at two to start a kid in the kitchen? Katie: Definitely not, and I usually recommend to parents, as a former teacher myself who learned a lot about childhood development in college and then now teaching an online cooking class for kids – I work with a lot of families, and the earlier, the better, honestly. I recommend getting kids in a sling or a baby carrier, watching you, you know, handing them carrots and things for them to just put in their mouth and teethe on. Any experience with food and in the kitchen is a good thing, and so the sooner they can get their hands in, the sooner we can kind of get over ourselves and get them in there, the better. Alyssa: That’s a great idea, to put them in a carrier. I never thought about that, like having them watch you do your kitchen duties, you know, chopping, slicing, without them actually getting in the way. Katie: Right, absolutely. And then even as young as 18 months – you know, they really are highly motivated to be involved at that time, and so we don’t want to waste that, right? We don’t want to be pushing them out just because we are nervous or unsure or we think they’re going to make a mess. You know, life is messy at that age; might as well have them close to us. And so I love having kids that age to be smelling spices and maybe even, you know, put a little spice or herb in your hand and let them touch it and let them put it on their tongue just for experiential sake. You know, we give our kids butter knives at 18 months or 2 years of age and teach them how to be safe with those butter knives, and then by the time they’re five or six, we’re moving on to sharp knives already, to tell you the truth. Alyssa: Oh, wow! I wish! Katie: But it’s a process, and you don’t want to go right to sharp knives, but definitely a butter knife and a banana, with a parent who’s showing you where to put your other hand that’s not holding the knife, is a pretty safe endeavor, and it’s so empowering for the kids to feel like they’ve done something real and helpful. Alyssa: Right. So how do you graduate them? What does the kitchen look like for a two-year-old versus a five-year-old versus an eight-year-old? Katie: Yeah, for me it’s all about counter height. So if you think about an adult and where the counter feels comfortable, it’s usually about your belly button. Any higher than that, and your elbows are kind of going awkward when you’re working. So I try to do the same things for the little ones. For both the two- and the five-year-olds, I prefer to get them to the table. Unless you have one of those cool things where the kids can climb right in and be up at the counter without worrying about falling off a chair, I like to get them right to the kitchen table because it’s lower and still on a chair and up on their knees so that they are high up above their food. They can see what they’re doing, and that keeps them in control and keeps them safe. Also, they’re out of the kitchen, so there’s less elbow-room-jostling, you know. Mom or Dad is working in the kitchen, and you’re like, oh, I don’t want people in here. So if you can teach your kids some skills, and then you can set them up at the table practicing their skills while you’re in the kitchen, you’re still together but they’re not in your way. Alyssa: Right. That’s a great idea because I’m probably just as clumsy as my daughter, and I don’t trust myself half the time with the sharp knife. So having her too close is probably not a good thing. 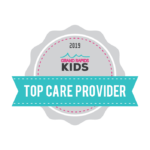 So you have a PDF that you’ve been working on for us, specifically, because you have online right now some PDFs for 10 snacks that your kids can make, and they’re healthy, but you have tailored one for us that is preschool-age specifically. Let’s tell people how to find it and why they’d want to download this. What’s on it? Katie: Yeah, exactly. 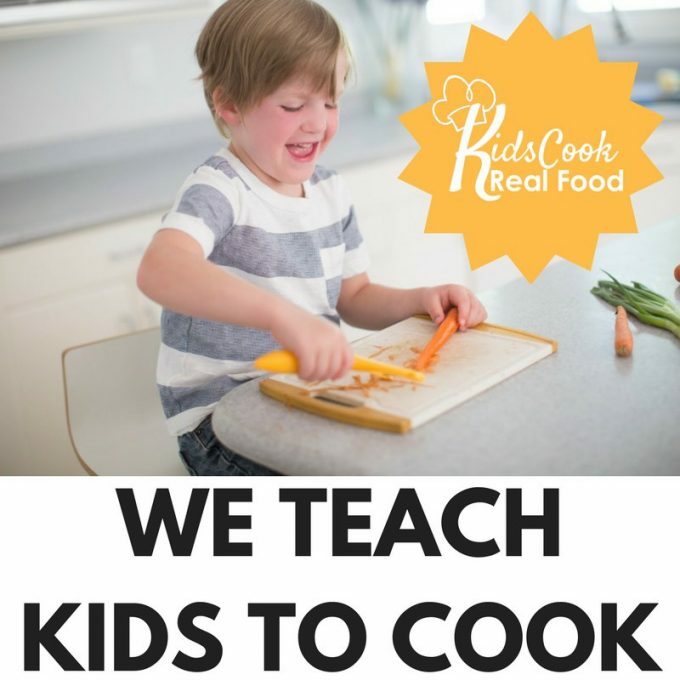 You can go to www.kidscookrealfood.com/doula, and Kids Cook Real Food is, again, our online video cooking class for kids. My kids and I put that together, and we’re offering a totally free download for ten snacks your preschooler can make today, and I think today is the most important word because it’s not – you know, it’s just telling you that they’re easy; it’s possible to get preschoolers, kids who are three and four years old, really, really young, in the kitchen, and not only in the kitchen but doing actual things, not just stirring and dumping ingredients in. Like, they can really help and do at least half if not all of each of these recipes. Alyssa: Right. So I have your other PDF, the ten snacks kids can make, and I really love that you’ve – because my daughter is just learning how to read, but she can’t read the word tablespoon or teaspoon. So you actually have these portions called mom, dad, kid, and baby, and my daughter could read those words, and she would know what those are when you set those all out. So I thought that was a brilliant way to teach that to a preschooler. Katie: Thank you! It’s all about empowering kids to be able to do things on their own, right? And that helps the whole family. So when we can teach the kids – first of all, putting things in size order is totally a preschool skill; it’s developmentally perfect for what they’re doing. So if they can lay out your basic tablespoon, teaspoon, half-teaspoon, quarter, in order, and you just say, this is dad, mom, kid, baby – it’s language they know. Even if they can’t read those words, we use little picture images. They’re very easy to see, and so not only can they follow a recipe, really, as long as they know a couple numbers, but you can tell them from across the room, oh, grab the kid-size or grab the mom-size and measure some salt, and they can practice measuring. We have our kids of that age putting together homemade taco seasoning and homemade ranch dressing mix and dry seasoning mixes. Or like if I’m doing a slow-cooker meal, a three-year-old could measure out the herbs and the salt that go in there while I’m prepping the rest, and again, they’re genuinely contributing to the family, which for a child that age is halfway to a miracle, right? Alyssa: Right! So how closely do you have to watch a three-year-old who’s putting salt in and accidently pours the whole bottle – I just feel like if I left my five-year-old kind of have total control, who knows how this would end up tasting. Katie: Right. Well, it’s a training thing, right? So I look at everything in the kitchen as a specific skill. So once they learn the skill of measuring, where you’re very much next to them and working with them, and it’s not dinner time. You know, when you’re teaching a new skill, it’s right after lunch when everyone is fed and happy, and you’re going to teach this skill with a big bowl of cheap salt or a 9×13 pan of cheap flour, right? That’s how we teach the measuring, so it doesn’t matter. There’s no goal other than teaching them how to measure flat, how to hold things, and then they can practice on something like that. It’s almost like a center in preschool. So we’ll have that 9×13 of flour, just throw the lid on, and we can get it out the next day when I’m in the kitchen and they want to be near, and then I can – once I’ve shown them close by, I can kind of direct from a little further away with my words, and so it’s definitely an individual thing. Once the child has shown that they know how to measure flat – we call it no holes, no hills, so it’s easy to remember, then you can trust them. Now, I mean, I’ve caught my seven-year-old or eight-year-old almost putting in a third-cup of baking powder. It’s supposed to be a half-teaspoon. So everybody makes mistakes, right? So it’s not always about age. It’s just an experience thing, and definitely, there’s an audit system where you should be able to look in and know if it’s a teaspoon or tablespoon of salt before you add it, but that’s why we’ll have them measure in small bowls, not into the big pot right away. Alyssa: And that kind of leads me to – I was reading somewhere, I don’t know if it was on the PDF or on your website, where at first when you started thinking about doing this and thinking about getting your children involved, it was like thinking about those craft projects where for two months, you’re finding glitter all over the house. This was kind of the same thing for you, of oh, do I really want to do this? How do you get over that? Like clean freaks; you know, I’m a clean freak. I’m constantly cleaning up after myself in the kitchen so I always have a clean workspace. You just kind of have to let that go with kids, right? Katie: I mean, you really do. With good training, they are less messy. There is no guarantee of no mess; that’s impossible, but they are less messy when they know what they’re doing. So we even teach four or five different ways to stir so there’s not that pop of, you know, you’re stirring and the spoon makes everything fly all over. Not that that doesn’t still happen; it does, but you work on it. I think for me, I’m super practical, so as much as I want to be clean, I also know in my head that my kids need these skills. Eating healthy is really important to me. I want them to be able to help out because I can’t do it all. You know, just physically, it’s not going to work, especially the closer my boys get to being teenagers. Like, I can’t cook that much food by myself! So I need help, and then I need them to be able to be independent and to feed themselves, right, so we’re raising independent adults, hopefully. And so I just have to tell myself, this will be worth it. This is an investment, and it’s totally worth it. Alyssa: Yep. Let it go; that’s kind of the common theme for having children in general, I think, is just let it go. Let go of some of that control. Katie: They teach you a new normal. Alyssa: Right, right. Well, I’m so excited to see this PDF. Tell us one more time how to find you and how to find the PDF. Katie: Yeah, so our online cooking class is at www.kidscookrealfood.com, and then the free gift for listeners is www.kidscookrealfood.com/doula, and that’s 10 Snacks Your Preschooler Can Make Today. Alyssa: Amazing. Thank you, and we’re going to have you on again to talk about kids’ eating habits another time, but thanks for sharing today! Katie: Sounds great! Thanks for having me, Alyssa. Alyssa: And as always, everyone, you can find us at www.goldcoastdoulas.com. Email us with info, suggestions, comments, and that’s info@goldcoastdoulas.com. Remember, these moments are golden.